The final phase of the brick sales from the Veterans Walkway of Honor will allow the Danbury War Memorial to donate $2000 to two veteran organizations. The organizations selected are the Connecticut Department of Veterans Affairs in Rocky Hill and the Friends of Fisher House CT in West Haven. Each will receive a check for $1000. The Fisher House Foundation builds and maintains long term residential facilities near military hospitals nationwide. The families of seriously injured soldiers need a place to stay during the long rehabilitation process. According to their website, this vital need is not covered by any other resource. Currently there are 75 Fisher Houses nationwide. Since 1990 they have provided services to over 335,000 military families who have stayed more than 7 million days supporting their soldier during rehabilitation. Fisher Houses have saved these families more than $407 million in lodging and transportation costs. According to the State of Connecticut website, the Department of Veterans Affairs provides general medical care for veterans honorably discharged from the Armed Forces. They have a Health Care Facility with approximately 180 beds that provides extended health care to veterans through physical therapy, occupational therapy, respiratory therapy, Alzheimer unit, and hospice care. They have a domicile with approximately 483 beds available that provides residents with a continuum of rehabilitation care. Veterans receive substance abuse treatment, educational and vocational rehabilitation, job skills development, self-enhancement workshops, employment assistance and transitional living opportunities. The Veterans Walkway of Honor at the Danbury War Memorial was dedicated in 2013. Since then it has raised more than $83,000, of which more than $47,000 went to support programs at the Danbury War Memorial and nearly $16,000 more for area organizations serving veterans, Teicholz said. 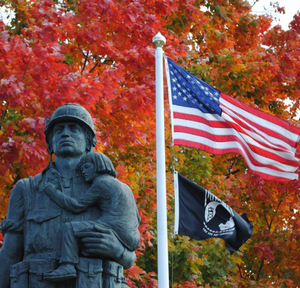 The checks will be presented after the annual Veteran’s Day Ceremony at the Danbury War Memorial on November 11th.